QUASAR offers 30 years of expertise to help you carry out your projects and guide you through the process. To this end, we offer you a range of services starting from the deployment phase and up to the operational phase to provide you with a product customization tailored to your needs. Our multilingual support team intervenes for the correction of anomalies and operating faults. We train your teams to use our products and to the M.E.S software environment. Our team of consultants assists you on a daily basis for a successful deployment of our solutions. We offer a turnkey installation of industrial terminals to complete your IT equipment. Equipment maintenance is integrated in standard. Our team guides you through the versions' upgrades and through the evolutions related to the life of your company. We organize friendly day-long events for our customers to discover new versions, exchange with our teams and share feedback with users. We attach great importance to the quality of our services and the satisfaction given to our customers. It is reflected in all our internal processes and applies to all our teams. All our features are tested by our test team before delivery of developments to our customers. The risk of bugs or malfunctions is reduced to a minimum. It also means fewer back-and-forth movements and a significant time gain. The team QUASAR operates according to the agile methods principles. The self-organization of teams allows much more responsiveness to meet customers’ needs, increases the fluidity of deliveries, and makes it possible to manage more effectively risks and changes during the delivery. QUASAR evolves daily through customer developments and technological innovations. The product owner keeps a roadmap up to date and meets regularly with their teams to give a clear course for all future developments. 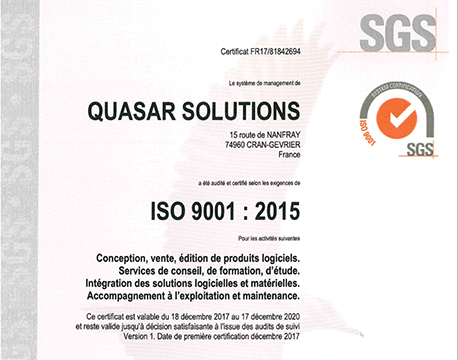 QUASAR is ISO 9001-2015 certified. All internal processes comply with the standard’s requirements. To ensure regular follow-up of service quality and to strive for continuous improvement, each department communicates monthly its performance indicators and its areas of improvement to our quality referent. The latter regularly monitors the correct application of the standard’s key principles and ensures optimal operation of the company’s quality processes. We offer three levels of services according to your support needs.